New Hampshire Home Builders Association awards Belknap Landscape Company with six awards. 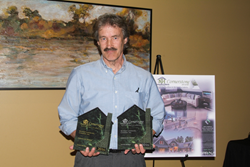 Craig Wentworth of Belknap Landscape Company holds two of the six Cornerstone Awards that Belknap Landscape Company received from the NHHBA. Photo Credit: Bonnie St. Pierre. We give all of our clients the “the Belknap Experience” that allows them to sit back and relax throughout the process and let us take care of everything. In the end, they have a unique landscape that surpasses all of their expectations. Belknap Landscape Company, a family-owned business operating out of the Lakes Region of New Hampshire since 1988, was honored with six New Hampshire Home Builders Association Cornerstone Awards for 2016. The NHHBA gives Cornerstone Awards annually to businesses in various industries, from architects and interior designers to contractors and landscape companies. The 2016 Cornerstone Award presentation was held in Manchester, NH at the Riverside Room. The awards are given to companies that have demonstrated skill and excellence on unique projects and their process. Projects are submitted to their respective categories and then judged by home builder association members outside of New Hampshire. The judging is conducted with no knowledge of what companies are responsible for the projects which allows the selection process to be unbiased and based on the quality of the project, the use of space, materials used, and any difficulties that were navigated around throughout the process. Belknap Landscape Company was honored with six awards by the NHHBA, including a Gold and a Silver award in Landscape Design for their work with two lakefront properties including masonry, landscaping, fireplaces and outdoor kitchens. BLC received a Gold Award in Residential Landscape Construction for working around existing conditions included with lakefront properties and through permitting guidelines to create a unique outdoor living space. The local landscape company was also awarded a Gold and Silver Stonework/ Masonry award and a Bronze Outdoor Living award. Belknap Landscape Company is a family owned full service landscape company located in Gilford, New Hampshire, offering design and build services, lighting, tree work and irrigation services for commercial and residential properties. BLC is powered by LandOpt, members of the National Association of Landscape Professional, NH Lakes Association, Snow and Ice Management Association, the NH Home Builders Association and accredited by the Tree Care Industry Association. To find out more about Belknap Landscape, visit their website or Houzz.